Start your team’s day with a motivational breakfast or treat your VIPs to a morning meeting that is accented by fabulous food! 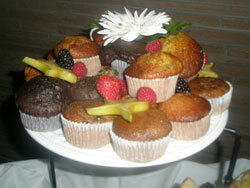 Our breakfast services can be informal, or can include full China & Silver service. From quick & healthy to hearty & elegant, we’ll provide you with the ideal beginning to a creative day. Ask about our Live Action stations! 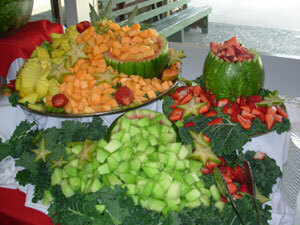 Fresh Fruit – The Season’s Finest! Optional Additions – Enrich the Day! Above pricing is valid Monday through Friday. $35 delivery charge and 19% Service Charge will be added to final bill. Pricing includes drop off and set-up of food items, one linen for food table, vase of flowers, rental of all serving dishes & utensils, and disposable dishwares. On-site server and china available upon request. Please contact us for pricing. Minimum 25 Guests.